On top of a full range of Ryzen 3rd Generation desktop processors, it looks like AMD already has a few mobile CPUs inside upcoming laptops. Hexus spotted Geekbench results for three different AMD Ryzen 3000 Series Picasso APUs fitted inside two classified HP laptops. 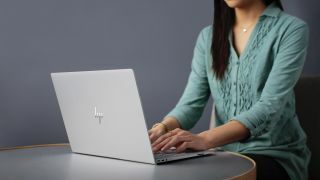 First up is the HP Laptop 17-ca1xxx equipped with an AMD Ryzen 5 3500U, which is listed as a 2.1GHz quad-core processor featuring eight threads and Radeon Vega Mobile Gfx integrated graphics. A second HP Laptop 17-ca1xxx showed up in GeekBench’s records twice, but equipped with a different AMD Ryzen 3 3300U CPU. It seems to be a small step behind the chip listed above as it only has 4-cores, 4-threads running at 2.1GHz with Radeon Vega Mobile Gfx integrated graphics. Lastly, the HP Laptop 14-cm1xxx showed up with a 2.6GHz MD Ryzen 3 3200U that appears to be a dual-core processor featuring 4 threads and Radeon Vega Mobile Gfx integrated graphics. Geekbench results are always a little shaky, but TUM_APISAK also corroborated the report by tweeting out the same processor names along with a two additional chips. Interestingly, the serial leaker noted there will be a high-end Ryzen 7 3700U CPU equipped with 4-cores, 8-threads running between 2.2GHz and 3.8GHz base and boost frequencies, respectively. The 300U was also listed as an extremely low-end 300U chip that might be destined for the first AMD-powered Chromebooks. Digging into the details listed on the GeekBench results seem to reveal that upcoming Picasso APUs will pair 12nm FinFET Raven Ridge CPUs with Vega GPUs. So these chips may technically be part of an extended Ryzen 2nd Generation family due to its use of the 12nm Zen+ architecture. At CES 2019, we fully expect AMD will announce its hotly anticipated 7nm Zen 2 architecture that should be the foundation of the company’s next Ryzen 3rd Generation and Ryzen Threadripper 3rd Generation processors.